This is the third Inspector Gamache novel I’ve read, and they have all been wonderful. Ms. Penny connects you to the characters, making the book more than just a murder investigation. As with the other two books, Ms. Penny ties everything together with a common theme that weaves throughout the story – this book centers around the theme of love. 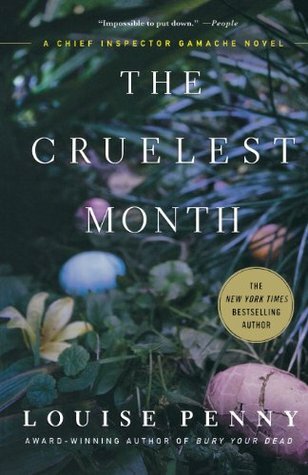 The Cruelest Month brings us back to the town of Three Pines, a lovely village in south Quebec. One of the villagers has died from fright – or so it seems. Gamache is called in to investigate, and realizes that things may not be as they appear. In addition to the murder, Gamache is facing a threat on the inside. Someone on his team is trying to bring him down for actions on a past investigation. As the reader, we know who is scheming against him, but Gamache is in the dark. I think what I like best about these books is Gamache and his investigating style. [Gamache] listened to people, took notes, gathered evidence, like all his colleagues. But he did one more thing. He gathered feelings. He collected emotions. Because murder was deeply human. It wasn’t about what people did. No, it was about how they felt, because that’s where it all started. As a result of his style, Gamache builds deep relationships with his team and the people of Three Pines. And while this is his greatest strength, some see it as his greatest weakness as well – he sees the potential in people and wants to save everyone from themselves. I’ve only read Still Life in this series, but I loved it! This series has been on my TBR for awhile and I’m glad to know I can just jump right in. I love the sound of this one! I have had my eye on this series for a while now. Glad to hear it is a good one and can jump in if I want to. Great review!